There’s a restaurant in Butte, Montana called Pork Chop John’s. If you are ever there, I highly recommend stopping by. The “meat” of the sandwich is a breaded and fried slice of pork tenderloin. It’s served on a hamburger roll with traditional hamburger fixings… and it is delicious… and I don’t really like most pork. I definitely don’t like most pork chops. Lightly mix the egg in milk in a shallow bowl that is wide/long enough to get the pork chop in easily. Set aside. Crush the crackers to crumbs and put in a second bowl (same type as egg mix bowl). 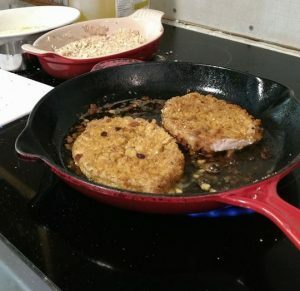 Place the pork chops one at a time on the cutting board and pound them on both sides with the mallet. You want to be able to see the indentations from the mallet, but no holes! Keep that aggression under control. Salt and pepper both sides to taste. Put paprika (or spice of your choice) to taste in with cracker crumbs and mix up. Heat your oil in your fry pan until something dropped in sizzles. Then keep the heat at about medium to medium high. You want them to have time to cook the meat without burning the coating. 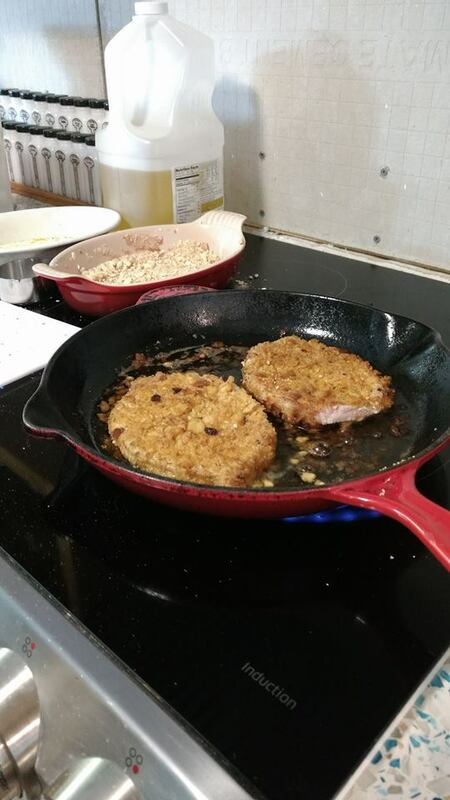 Coat each pork chop in the egg/milk mixture followed by the cracker crumbs and then fry! I use an instant read thermometer to get the meat to 145 degrees Fahrenheit. 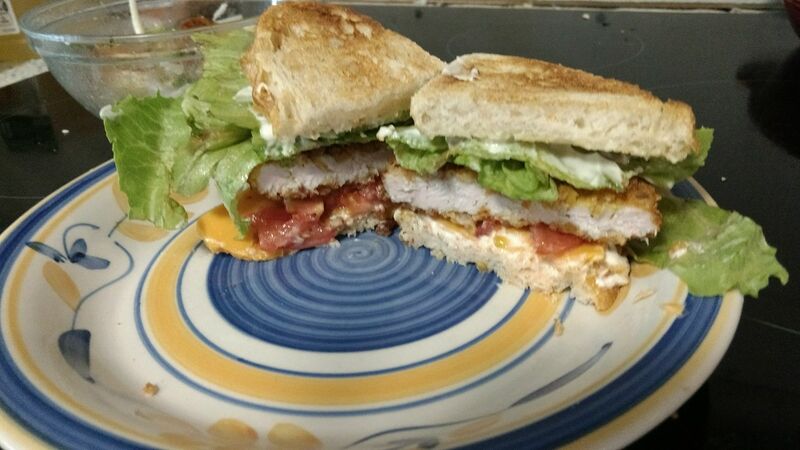 Serve on your favorite bread/roll with mayo, lettuce, tomato… whatever you enjoy most.